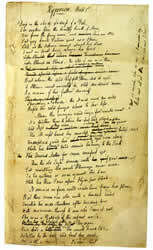 Original literary manuscripts by John Keats (1795-1821) (Hyperion; ‘I stood tiptoe upon a little hill’; the Pot of Basil; St Agnes Eve; and other poems), together with c50 letters by Keats, a story by Fanny Brawne, and writings on Keats by Byron, Browning, Swinburne, Rossetti, Wilde and Joseph Severn. A substantial body of material relating to Leigh Hunt (1784-1859), including two volumes of poems, two plays, key poems such as The Story of Rimini, many hundreds of letters (correspondents include Carlyle, Dickens, Lamb, Christina Rossetti, Percy Shelley, Mary Shelley, Tennyson and Thackeray). and much on the Monthly Mirror, radicalism and romanticism. A small collection of the papers of the radical author, publisher and bookseller, William Hone (1780-1842), including his History of Parody, notes for an autobiography, and extensive correspondence. Extensive material for Percy Bysshe Shelley (1792-1822), including Laon & Cynthia, The Daemon of the World, and other poems; the diaries of Clara Clairmont and letters of Jane Williams; Shelley’s annotated copy of Seneca; the manuscript Life of Shelley by Hogg; and many fascinating letters and manuscripts relating to his death.